Since it was first released in 1998, the Audi TT has been Audi’s sports car style leader. The first production TT was virtually unchanged from the auto show concept car that preceded it. Today, the 2017 Audi TT Roadster continues this tradition as a dramatically styled two-seater with a folding soft top. The 2017 Audi TT Roadster’s bold lines and neatly radiused curves are draped over the VW family’s widely shared transverse front-engine architecture. 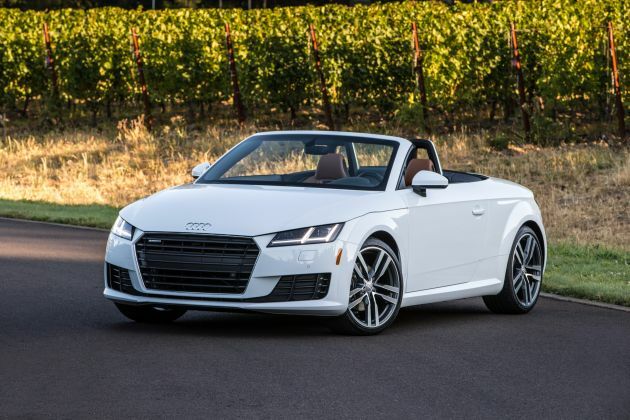 The TT Roadster has the same 220-horsepower turbocharged engine and quattro® all-wheel drive as the Audi A3 Cabriolet. Compared to the 4-seater A3, the TT Roadster provides a more intimate sports car experience. The interior is beautifully finished and very comfortable for trips of all durations. The available Nappa Leather sport seats include neck-level heating to keep you warm when the top is down. A nice touch! If you are looking for a stylish but practical sports car that you can use everyday and in all conditions, check out the 2017 Audi TT Roadster.